Be the first to share your favorite memory, photo or story of Arvin. This memorial page is dedicated for family, friends and future generations to celebrate the life of their loved one. 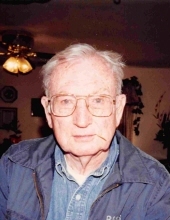 Arvin Washington Varner, 92, of Bridgewater, went to be with his Lord and Savior on Thursday, March 21, 2019 at VA Medical Center in Martiinsburg, WV. He was born in Sugar Grove, WV on May 18, 1926, and was a son of the late Daniel Webster and Ella Tiny (Puffenbarger) Varner. Arvin retired from Suter's Furniture after 42 years of service. He served his country in the U.S. Navy during WW II, on the USS Vicksburg, in Iwo Jima and Okinawa where he became a 100% rated combat veteran. He was a member of the Waterman Drive VFW Post #632 and the Dayton American Legion Post #27. He was united in marriage on November 4, 1950 to Lennis Maxine (Sheffer) Varner. Surviving in additon to his wife is his son,Rickey Lee "Rick" Varner, Sr. and wife Linda, of Harrisonburg; two grandsons, Rickey L. Varner, Jr. and wife Kimberly, of Bridgewater, and Michael Scott Varner, of Mt. Carmel, TN, eight great grandchildren, Brettnay Brazzell, Julianna Varner, Justus Varner, Jonathan Varner, Joshua Varner, Brandon Varner, Abigail Varner, and Adelynn Varner; and two great-great grandchildren, Eden Brazzell and Knox Brazzell, and numerous nieces and nephews. He was preceded in death by a great grandson, Clay Varner, a sister, Cleda Puffenbarger, and two brothers, Clyde Varner and Wilmer Varner. A funeral service will be held at 11:00 AM on Saturday, March 30, 2019 at Johnson Funeral Service in Bridgewater with Michael J. Barko and Pastor Jeremiah Reamer officiating. Burial will follow at Oak Lawn Cemetery with military honors by the Dayton American Legion Post #27. The family will receive friends on 6:00 PM to 8:00 PM on Friday, March 29, 2019 at Johnson Funeral Service in Bridgewater. In lieu of flowers, memorial contributions may be made to Waterman Drive VFW Post #632. To send flowers or a remembrance gift to the family of Arvin Washington Varner, please visit our Tribute Store. "Email Address" would like to share the life celebration of Arvin Washington Varner. Click on the "link" to go to share a favorite memory or leave a condolence message for the family.